Which Witch Has the Spider? When I saw this witch over at Beccy's Place, I knew I had to get her colored up and ready for Halloween. I love fun Halloween cards and even though I really hate spiders, this one was almost cute. 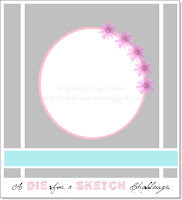 I used the sketch from A Die for a Sketch. 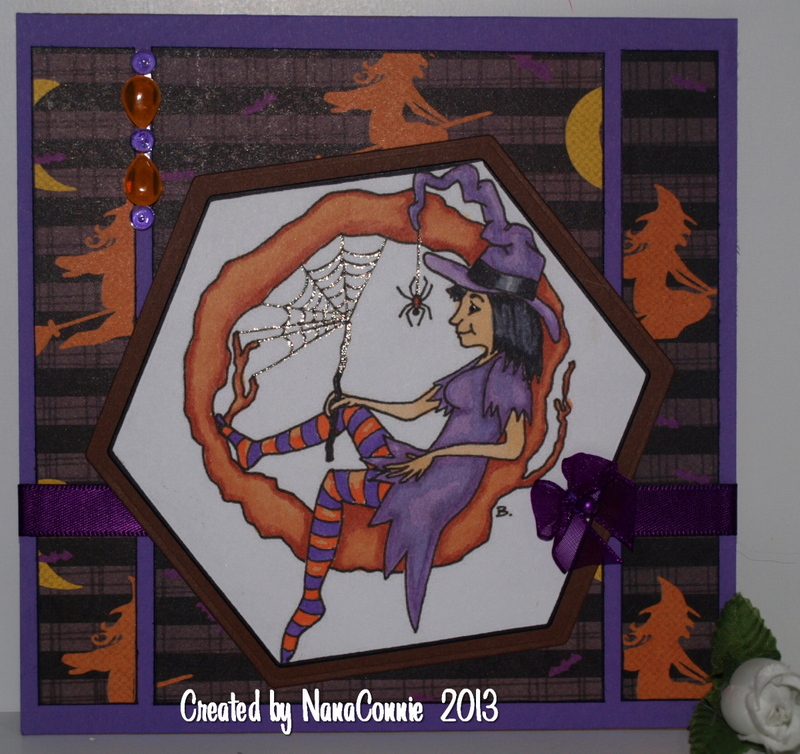 The image is colored with ProMarkers and I added a bit of glitter gel ink to the spider's web and to her wand. I used a hexagon die to cut both the image and the mat. The paper has been in my fall stash for waaay too many years and is by DCWV but was probably discontinued long ago. I thought it made a great background for this fun witch. The purple ribbon is the last bit I had from some which was recycled from a potted plant and the bow is one of those I make myself. I added the Dew Drops (purple) and Rain Drops (orange) for embellishment and knew it was finished without anything more. This is truly one of those "less is more" cards. This adorable image is from QKR Stampede and they were generous enough to provide it to Lady Anne's for the progressive Christmas challenge. with a couple of small liberties taken like tilting the image background. 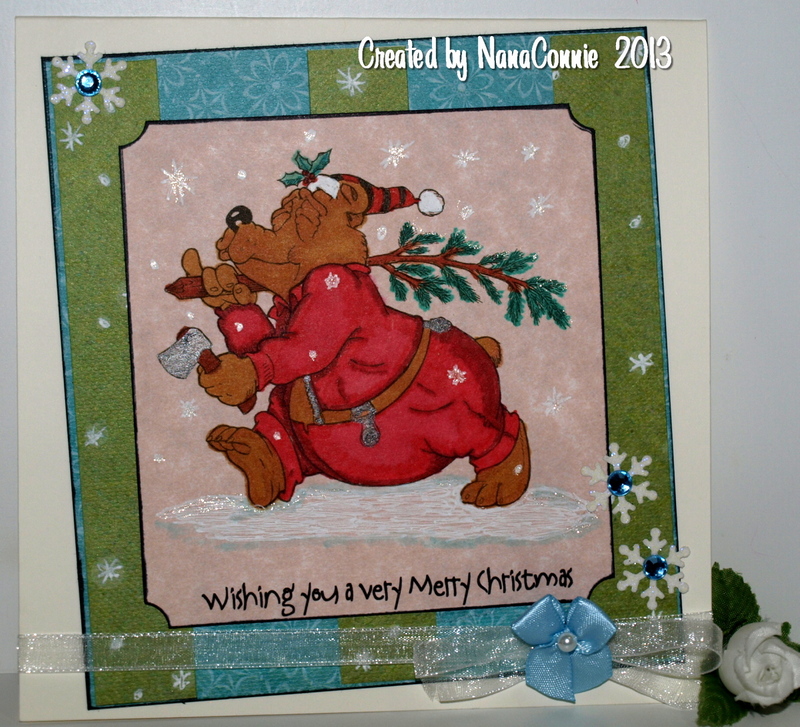 I used ProMarkers to color the image and used a white gel pen to add the snow and snowflakes. The ribbons came from my stash and the papers are some I've been hiding and hoarding so the maker is unknown. The white snowflake embellies are punched from vinyl and I added blue gems to them for a colder, more icy feel. We had a late start with our usual 1st of the Month New Releases at Doodle Pantry but it's here now and to make it up to you, Laurie is running a sale at the Doodle Pantry store. BTW, if you get over there and get some weird error message, be patient. The server had a major crash just as Laurie was getting ready to load all the new sets. Try again in a short while. My card today uses both an image and a sentiment from the new "Pumpkin" set. 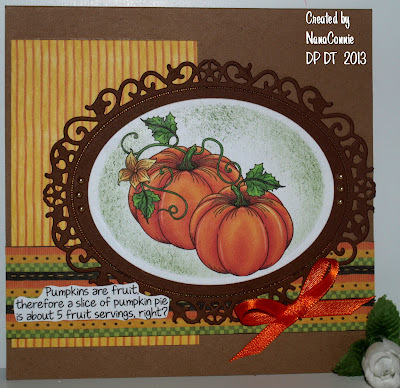 There is also a single pumpkin, several sentiments, and some gorgeous papers! This particular set will be the freebie with any purchase made by Sept. 24th. Aren't these gorgeous? Sketch came from 2 Sisters. This is a pre-colored image which I stippled after I die cut it, then I mounted it onto that lacy frame die cut (Spellbinders). The papers have been in my fall colors stash for a year and are from DCWV. Everything is layered onto a kraft card base. The white CS on which I printed the stamp and the orange bow are both recycled from a Thanksgiving card I received last year. The white CS was an insert to keep the card flat and the bow tied the envelope shut. I thought the little pearls on each side of the frame were exactly the right amount and size of embellies since this card has to be mailed. I wanted it relatively flat so that it would fit into a regular envelope. Scroll down for a peek at the whole Pumpkin set, then go check out all the rest of the new releases. Some adorable Christmas sets, and a couple more of Laurie's "Ants." You know what an absolute hoot they always are!